Facebook's new real-time commenting feature is now available to all users. 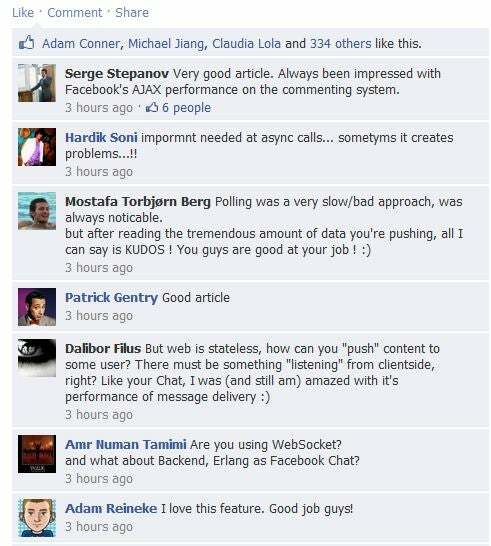 Live commenting allows Facebook members to see new comments from their friends without having to reload the page. "Live commenting, which we rolled out to all of our users a couple weeks ago, creates opportunities for spontaneous online conversations to take place in real time, leading to serendipitous connections that may not have ever happened otherwise," writes Facebook's Ken Deeter in a Monday blog post. The upgrade, which brings a more dynamic feel to the social network's interface, may also encourage users to spend more time on the site-certainly good news from Facebook's perspective. Enabling live commenting wasn't easy, however. Facebook engineers had to devise a new "push-based design" to get the feature to work on such a massive scale. "This wasn't a small challenge: every minute, we serve over 100 million pieces of content that may receive comments," Deeter writes. "In that same minute, users submit around 650,000 comments that need to get routed to the correct viewers. To make this feature work, we needed to invent new systems to handle load patterns that we had never dealt with before." So will Facebook users take to live commenting? That remains to be seen. It's possible that only the most devoted members will take advantage of the feature, while more casual users-those who visit the site occasionally a few times a day (or less)--won't find it very compelling. "Love the idea! But honestly, I didn't expect comment to be real time. Because I only check my Facebook feeds at most once an hour. I am not expecting to use fb as a communication tool such as MSN," writes user Zhang Yunqiao in the comments section of Deeter's blog. How about it, Facebook fans: Will you "Like" live commenting?